“Don’t play with your food!” is a common phrase directed at children. Typically, children are given food with one purpose: to eat it. However, our philosophy supports quite the opposite. We believe in allowing time for children to explore the food, experience it using all of their senses, grasp where it comes from and eventually learn to prepare it. 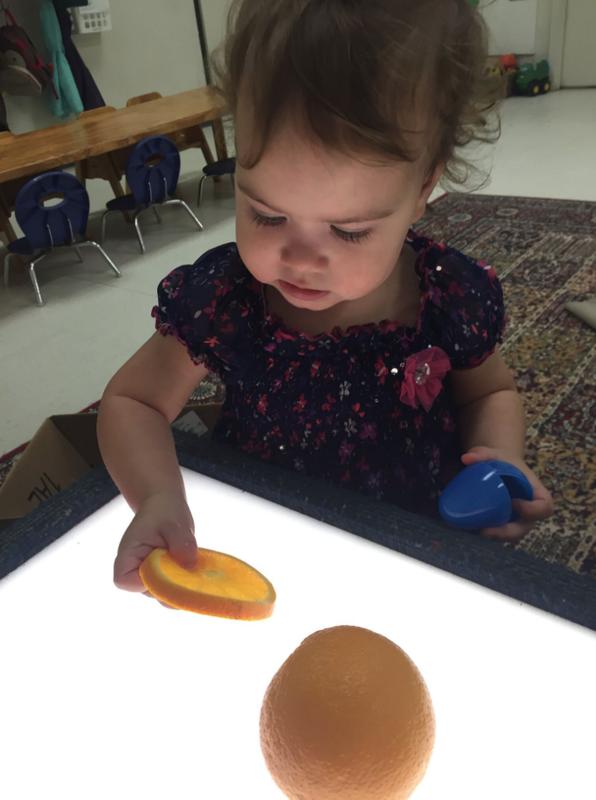 This week, the star of our food exploration was the orange. We brought whole and sliced oranges for the children to interact with. The children held the whole oranges, taking note of the fruit’s characteristics in its most natural state. 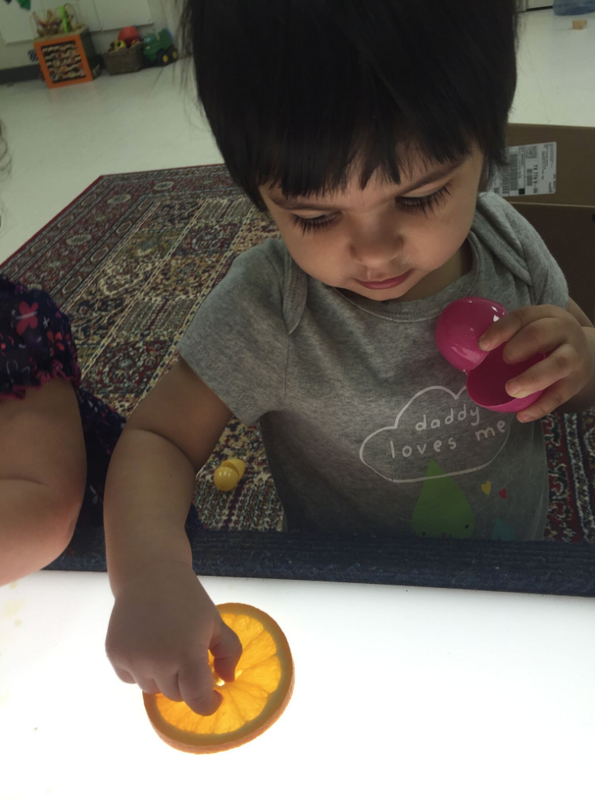 The slices of oranges were placed on the light table for the children to investigate, allowing them to take a closer look at the inner workings of the fruit. Allowing children to have this kind of exploration time with food opens the door to a variety of learning experiences. Mathematics was involved as the children counted the produce and number of slices. Practicing the name of the fruit enhanced communication skills, broadening vocabulary and word/object association. In learning more about the fruit’s properties the children gain a higher level of comfort with the food and are more likely to give it a try and enjoy it. In learning to prepare it, the children obtain a sense of independence and accomplishment. 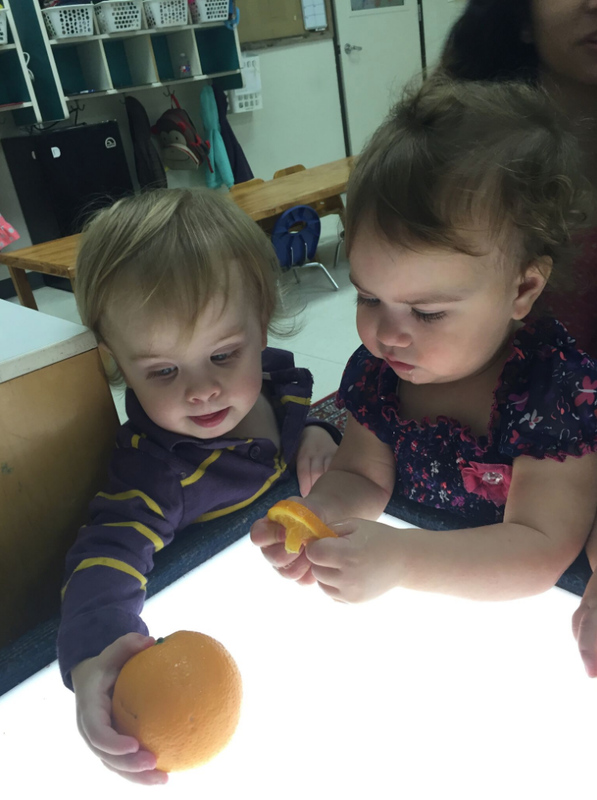 By engaging all of their senses, rather than taste alone, the children gained a deeper understanding of the fruit. As this happens, children learn to view food as something more than a snack. It becomes a learning mechanism, a source of artistic inspiration and a new way to look at and experience the natural world around them.